Thanksgiving recipes are my absolute favorite recipes ever and Thanksgiving is my favorite holiday! If it were up to me we would celebrate Thanksgiving every single month. 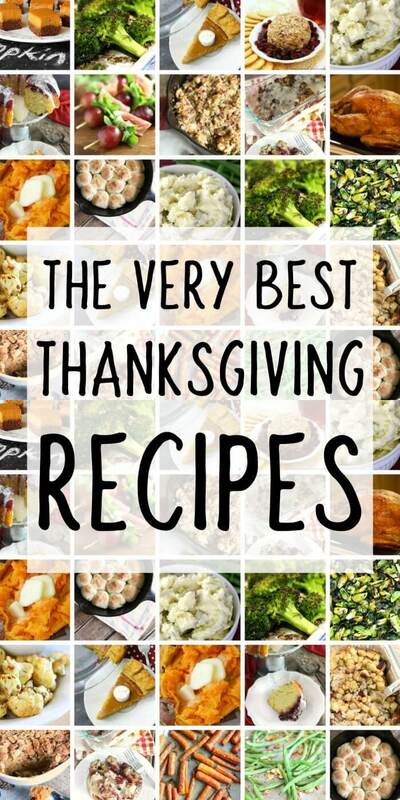 Check out our BEST Thanksgiving recipes here! 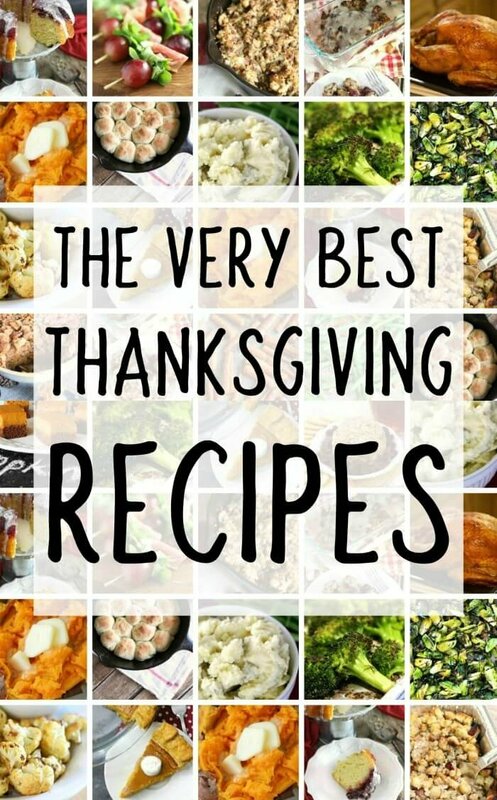 Thanksgiving recipes are the best, and we have the best Thanksgiving recipes! If I absolutely had to choose, I’d say definitely don’t skip the stuffing recipe, the mac and cheese, or the roasted brussel sprouts. Oh heck, don’t skip any of them! Love these Thanksgiving recipes? PIN THIS POST FOR LATER! 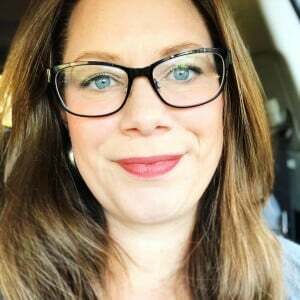 And follow Mama Loves Food on Pinterest for more easy recipes! 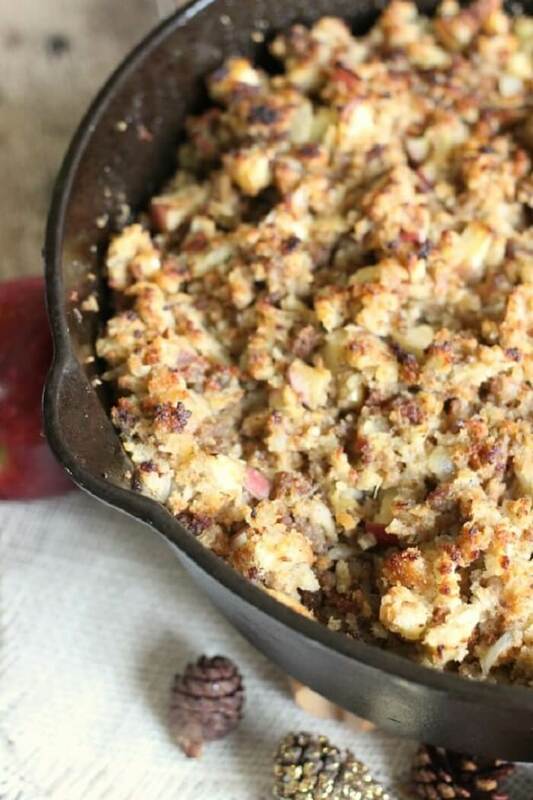 Stuffing is a necessity for any Thanksgiving dinner and this one made with sausage and apples is a total winner. It’s one of my favorite Thanksgiving Recipes. With just a handful of ingredients, this stuffing is super simple to make, but will absolutely be one of the stars of your meal (next to the turkey, of course). We’ve started our Thanksgiving recipes off right! Potatoes are a Thanksgiving staple. I mean, don’t get me wrong, mashed potatoes are amazing too, but you can never go wrong with a baked potato. 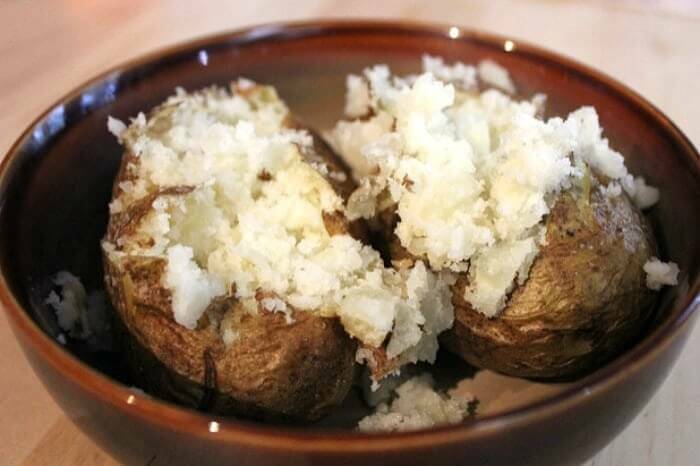 They’re easy to make, and this recipe will get you a perfect baked potato every time. Make sure if you add this to your catalog of Thanksgiving recipes, that you also include a toppings bar! Sweet potatoes at Thanksgiving are an absolute must have! 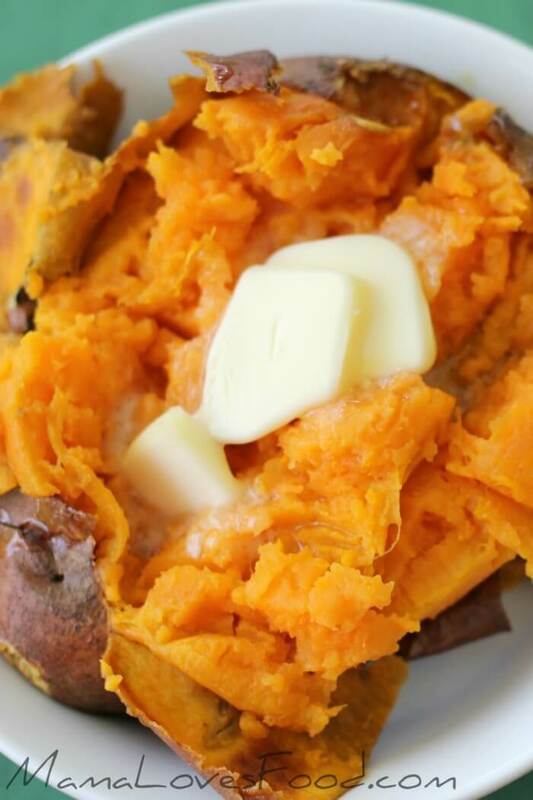 This recipe will give you perfectly baked sweet potatoes! There’s a reason this recipe has been pinned thousands and thousands of times! One of the best Thanksgiving recipes, for sure! 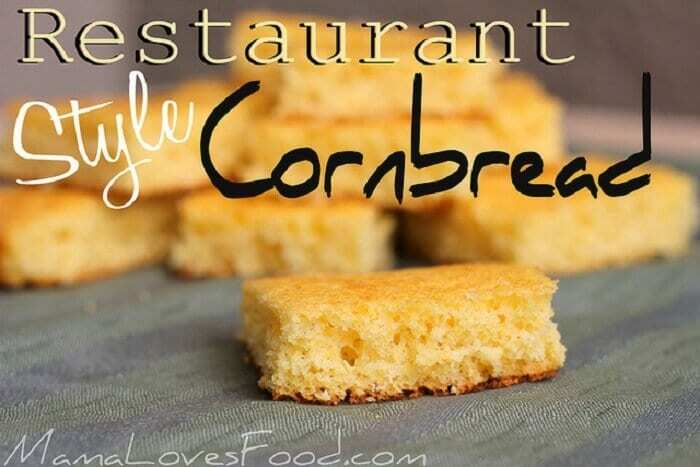 M’mm….cornbread. So light. So fluffy. So sweet and delicious. This recipe yields a lot, making it the perfect side dish to your Thanksgiving feast! We like to make this sweet cornbread in either a sheet pan or muffin tin. So easy to divvy up that way. Make Thanksgiving easier by asking everyone to bring a side dish or dessert. Use craft paper as a Thanksgiving table cloth and ask everyone to write what they’re thankful for. Take pictures of what everyone wrote and create a fun book or collage with them. Make sure to roast your turkey breast side down to have the juiciest meat ever. Swap Thanksgiving recipes with a friend and make each other’s traditional foods to try something new! 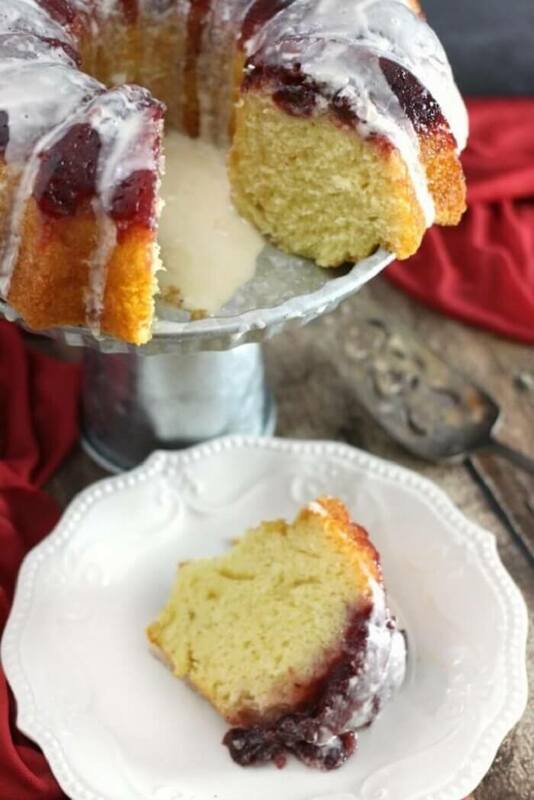 Every Thanksgiving dinner needs a few options for dessert, and this cake is a must have! It’s only two basic ingredients, but tastes heavenly! I promise everybody will be asking you for the recipe! This is one of those new classic Thanksgiving recipes just waiting to happen. What is a Thanksgiving dinner without the dinner rolls?? They’re the perfect companion to your fork, helping you scoop & soak up every last delicious bit of Thanksgiving dinner yumminess. 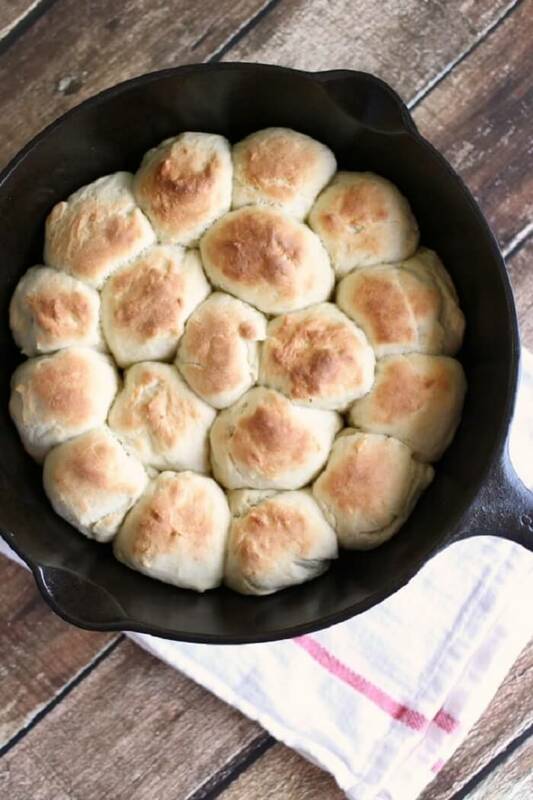 We love these dinner rolls because they bake up in 30 minutes from start to finish! Because Thanksgiving means lots and lots of food, of COURSE you are going to need an appetizer or two to tide you over until the turkey’s ready. 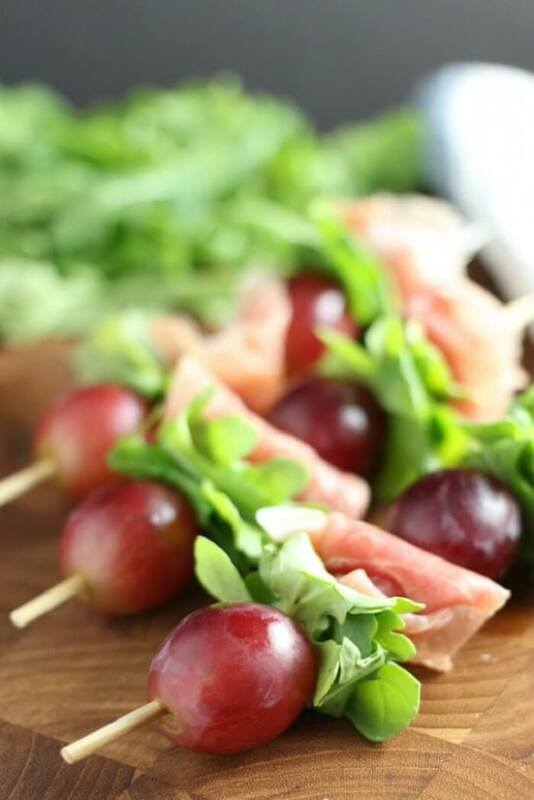 These skewers are sweet and savory, but healthy and light, so you can indulge in a few (or many) and still have room for the big stuff! I like to make these instead of a salad, no one eats a salad when they’ve got all these amazing Thanksgiving recipes to choose from! Nom nom nom. Macaroni and cheese is the bomb. You know what I love about it? It’s great as a main course, but it also works SO WELL as a side dish to all sorts of meals! 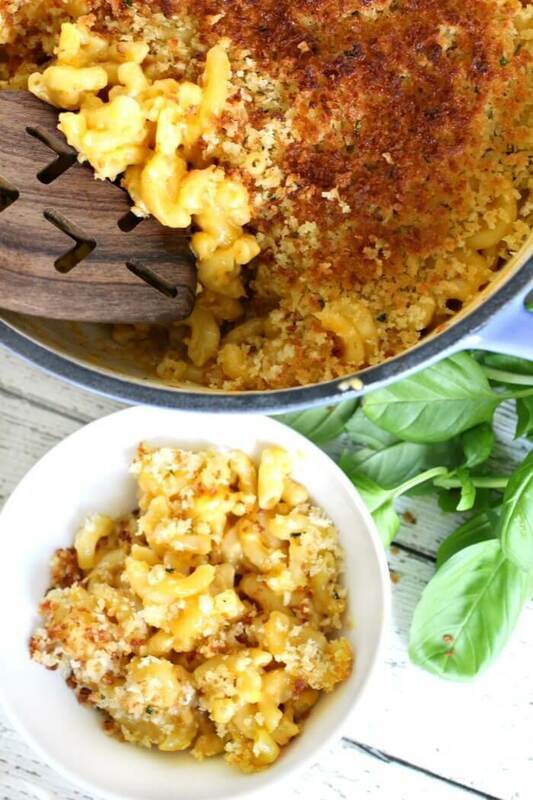 This macaroni & cheese recipe is made in just ONE POT, which means less time in the kitchen, less dishes to wash, and more time with family. It won’t only be one of your favorite Thanksgiving Recipes, but also one of your favorite ‘any day of the week recipes’! What is your favorite part of the Thanksgiving meal? Mine is, hands down, the mashed potatoes. 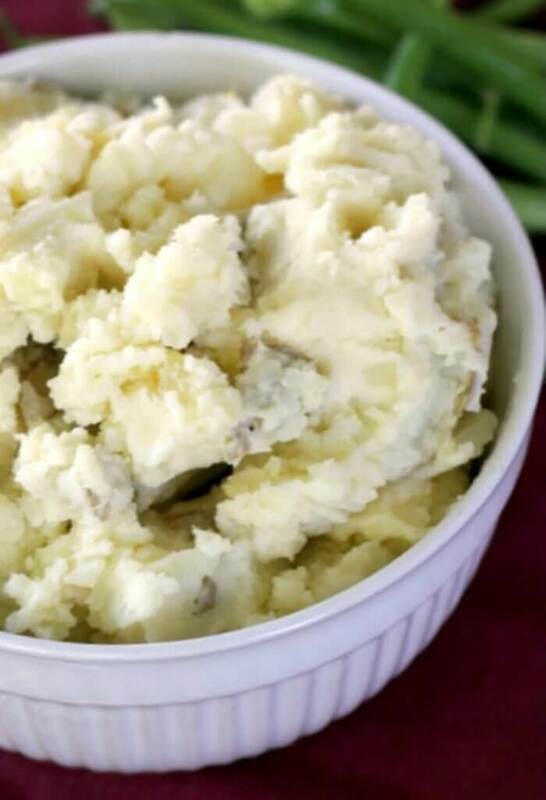 This mashed potatoes recipe is the creamiest, most flavorful, easiest mashed potato recipe you will ever make. If you make this, you won’t have leftovers, so when you pull up this collection of Thanksgiving Recipes next year, I hope you’ll remember to make a double batch. Everyone needs mashed potatoes in their turkey sandwich! Variety is the spice of life. Or in this case, Thanksgiving dinner. Serve them alongside your regular rolls or by themselves! Either way, they’re definitely going to add a touch of spice to your feast. I like these biscuits because they’re super easy and they make a delicious breakfast on the morning of Black Friday! We all know pumpkin pie is the true star of the Thanksgiving dessert table, but it’s also not for everybody and that’s OK! 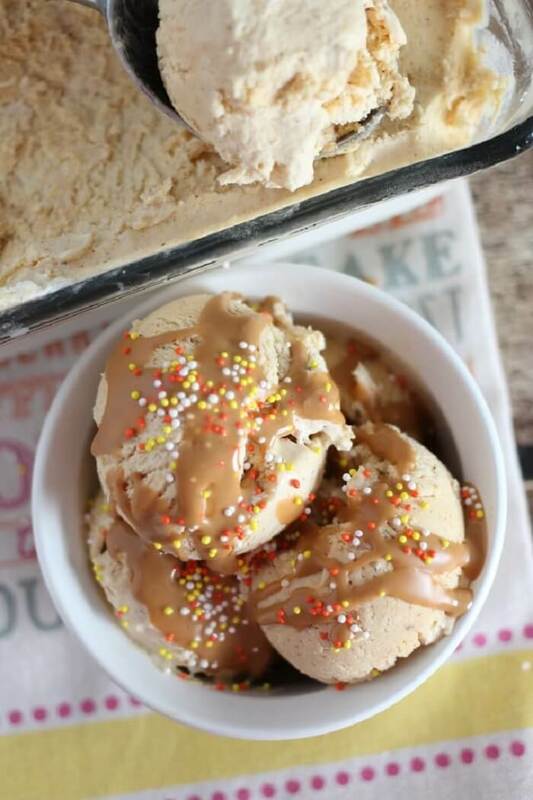 This no churn pumpkin ice cream is for the people who turn up their nose at pie, but still need a little taste of pumpkin. Who says you can’t have ice cream when it’s cold out? Not me! Although it’s quite warm here in Florida – so maybe this is one of those Floridian Thanksgiving Recipes. Ready for dessert, but not sure you can eat a whole slice of pie? 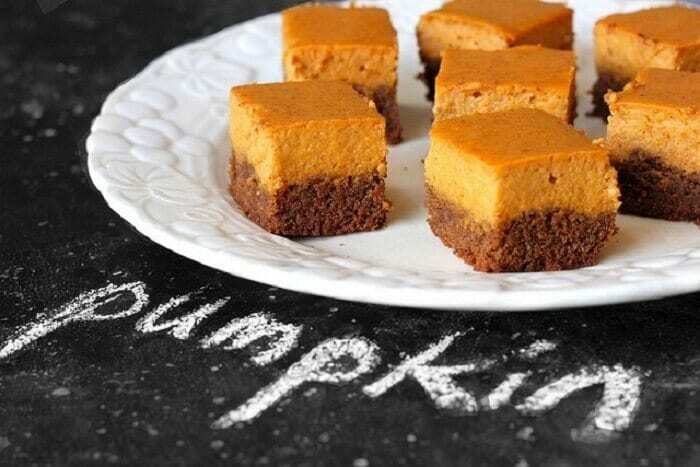 Enter: these pumpkin pie bites. All the fall holiday flavors you love in itty bitty bite sized pieces. They make a great appetizer, too! Be careful though, it’s easy to make them all disappear. You can’t go wrong with the classics, and pumpkin pie is THE classic to end all classics. 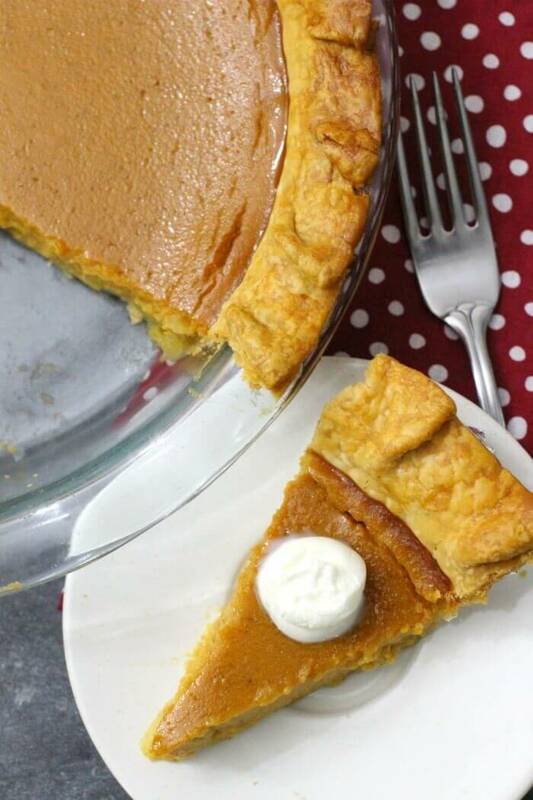 No Thanksgiving dinner is EVER complete without at least one pumpkin pie. The beauty of this pie is you can make it a few days ahead of time, so you have more time to spend with your loved ones and less time prepping food in the kitchen. If your list of Thanksgiving Recipes doesn’t include Pumpkin Pie, then I’m not sure we can even be friends! 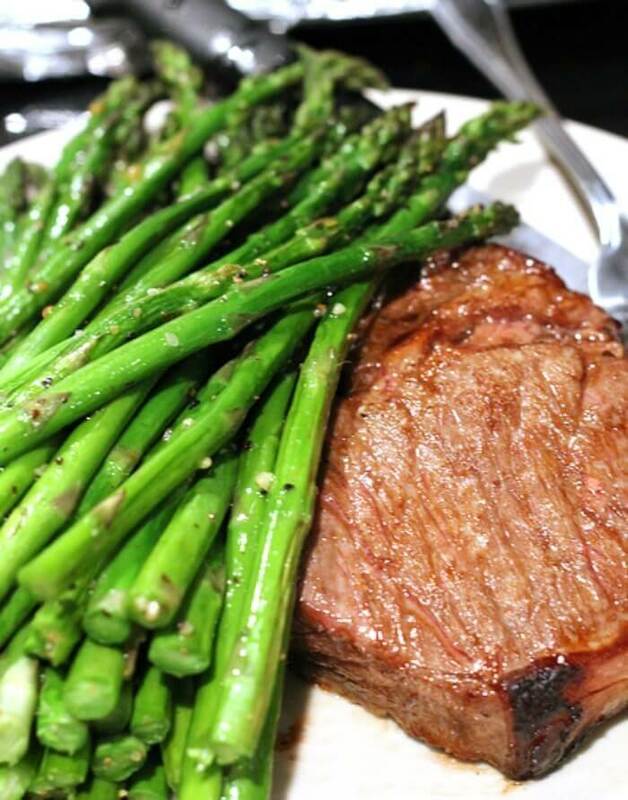 This roasted asparagus recipe is to DIE for. Even if you have no other veggies on your plate this Thanksgiving, be sure to at least include a big helping of this. YUM! The great thing about these is that they roast up so quickly – unlike so many other Thanksgiving recipes. I love love LOVE having a lot of veggie options at my Thanksgiving dinner. I think it helps me cut down on the guilt of stuffing my face with mashed potatoes and turkey gravy. 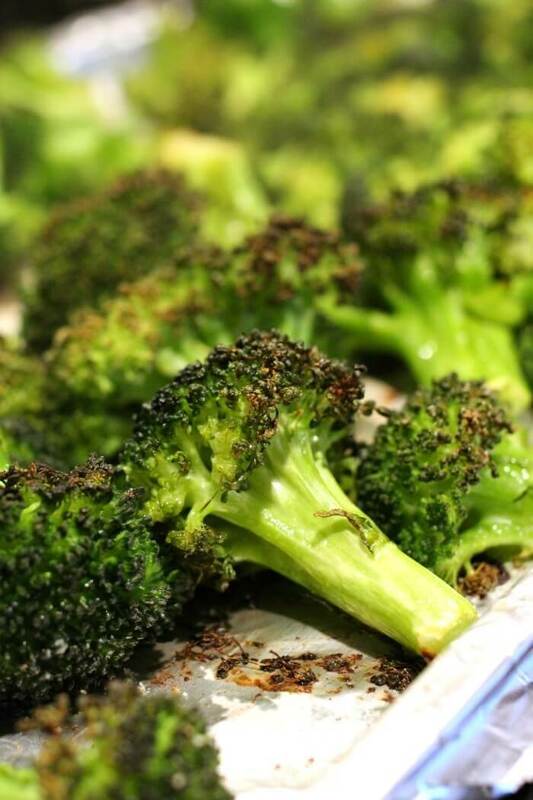 This broccoli recipe is amazing! My kids call this “burnt broccoli” and they love it! Haha! 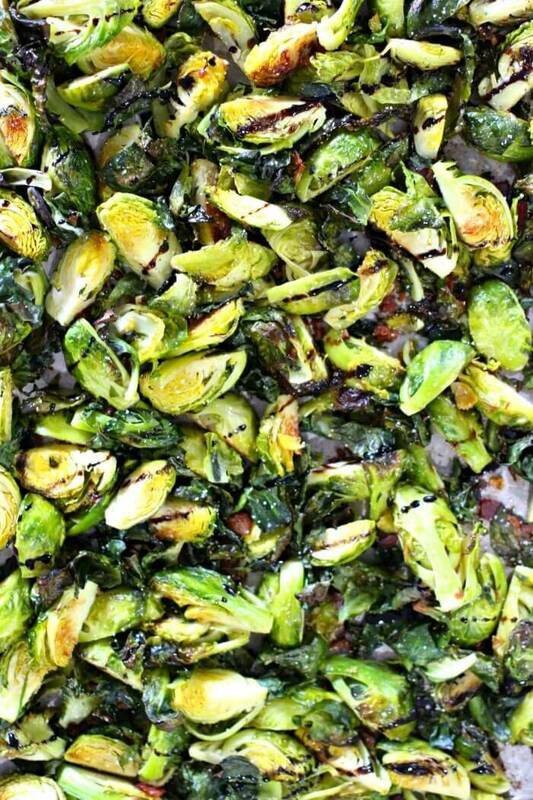 Not only will these brussel sprouts help curb all that overeating guilt you might experience on Thanksgiving, but they’re SUPER versatile. They’re great plain, but you can dress them up any which way you choose. I personally love them with some crispy bacon – they taste great next to that big ol’ pile of mashed potatoes. I’ll tell you a secret – when we make this as one of our Thanksgiving recipes, I’ll usually add a couple of cubed sweet potatoes to the pan to roast with the brussels sprouts. YUM. 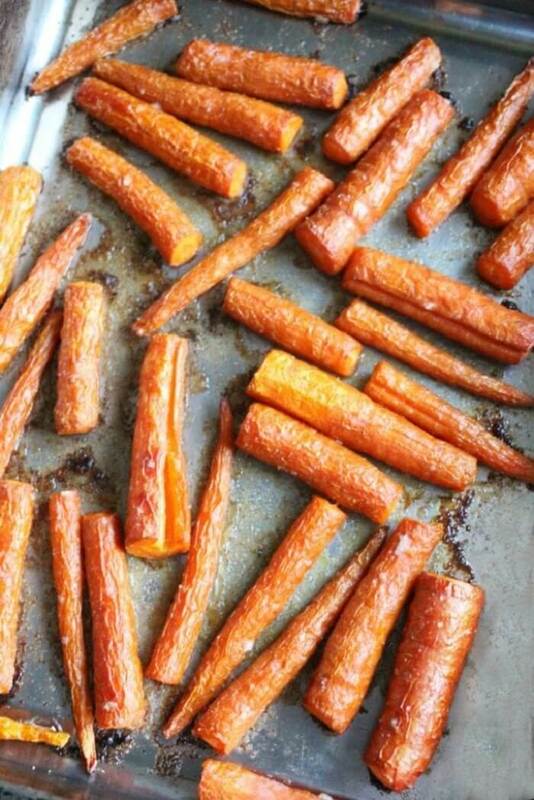 I can’t even lie, these roasted carrots are the most amazing carrots you will ever taste. There are times where I will make nothing BUT a pan of these for myself for dinner, because YUM. They will definitely bring your Thanksgiving Day meal up to a whole new level. 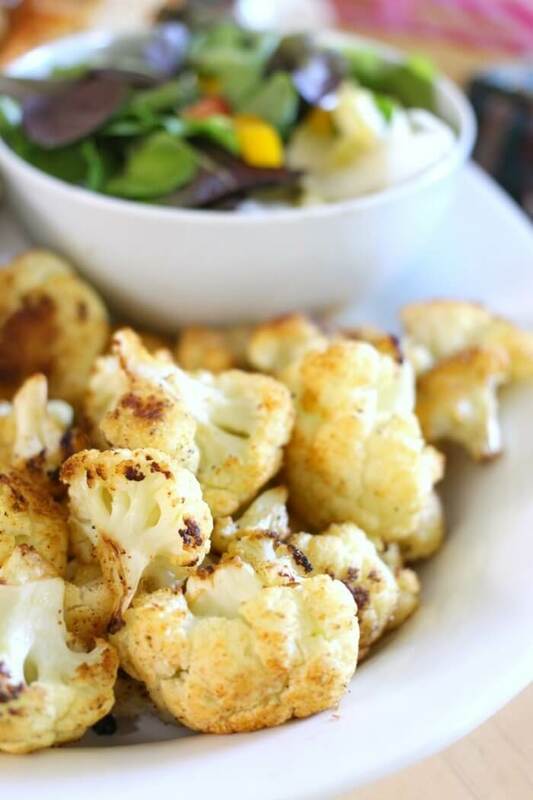 We always serve roasted cauliflower at our big holiday gatherings. Not only are they delicious, but they’re a fantastic substitute for mashed potatoes if you are trying to avoid carbs. If you like to serve salad as a first course, they taste amazing with spinach and a dijon mustard vinaigrette. Nom nom nom. Savory with a little hint of sweet and tangy, crunchy on top and chewy in the middle. Mmmmm. It comes together in no time, can be made ahead and is a major crowd pleaser. 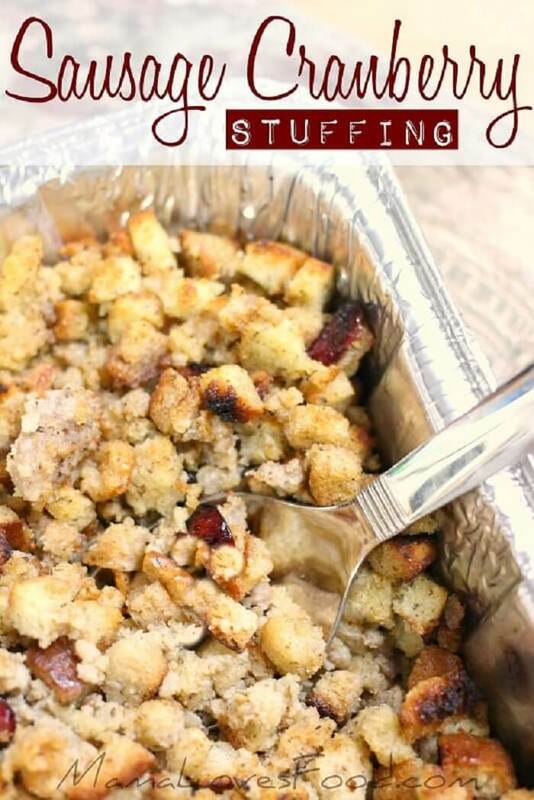 This stuffing is a winner all around. This is what Thanksgiving recipes are all about. 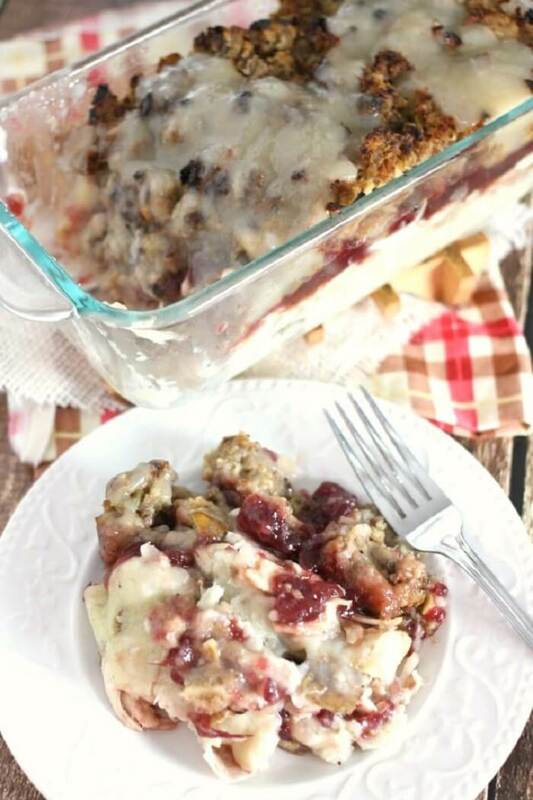 Confession: sometimes I make both kinds of stuffing for our table! 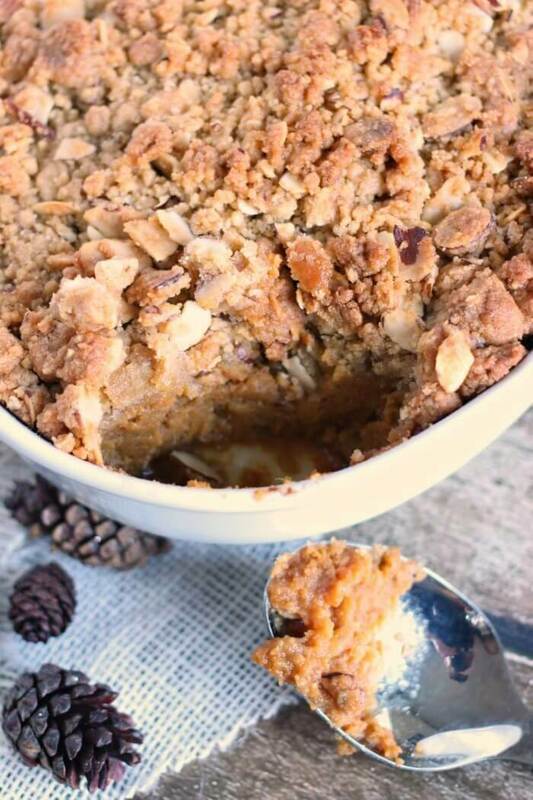 This sweet potato casserole was my Grandma’s recipe, and has always been a staple at our Thanksgiving dinners – I can’t imagine a holiday without it! It’s simple and sweet with a crunchy topping, and can be made up to two weeks in advance! I can’t have a Thanksgiving without this. It’s literally one of the best Thanksgiving recipes in existence. Forget the green bean casserole. 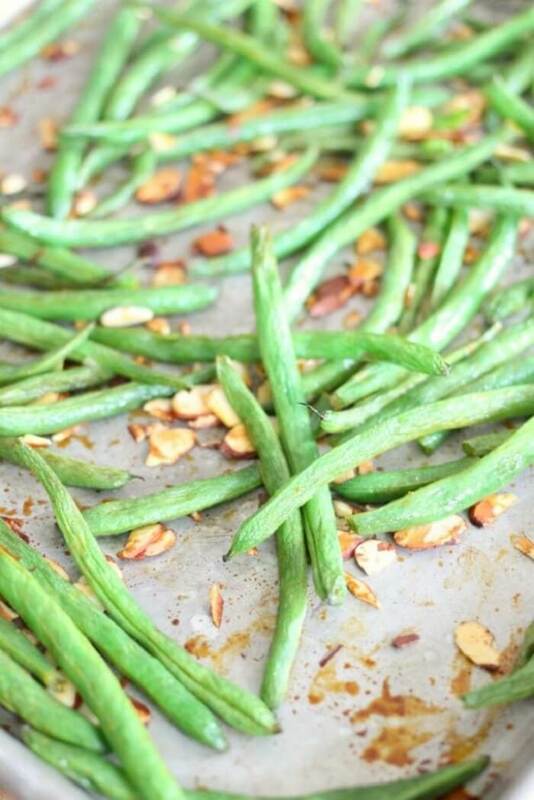 If you want to bring your Thanksgiving dinner up a notch, these sweet honey & sriracha roasted green beans are where it’s at! If you don’t like spice, just skip it – but yummmmmmm. Don’t skip it! 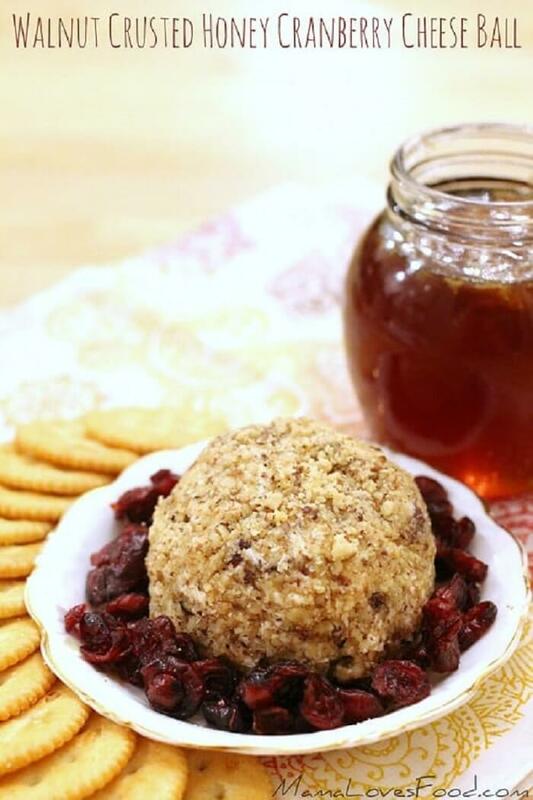 I feel like every holiday party or dinner needs a cheese ball. The cranberries add just the perfect amount of holiday flair. You can serve it as shown, or make miniature balls, which would be oh so fun! You could even warm it up in the oven for a few minutes before serving if you want it to be soft. Mmmmm. Whether you’re a seasoned vet, or roasting a turkey for the very first time (congratulations to you!) these tips will help your turkey live up to it’s full potential. 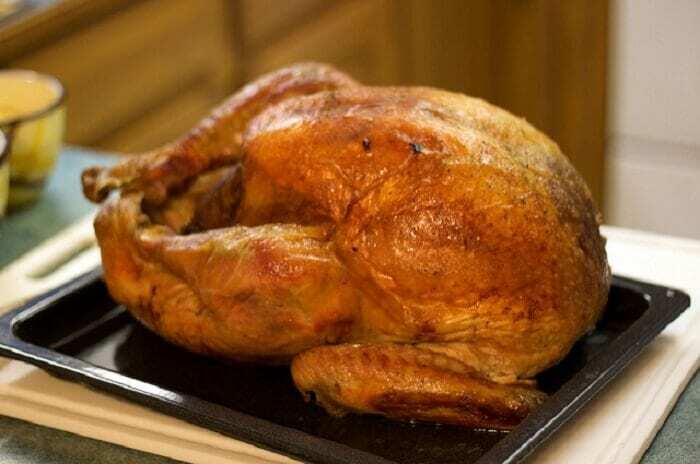 These tricks and tips will get you the most deliciously moist bird ever. Everyone will volunteer you to make the turkey next year! And what do you do with all those yummy leftovers? Make a casserole, of course! M’mm….I can’t wait for this! Maybe the best reason to make Thanksgiving recipes in the first place! You can't have a collection of Thanksgiving Recipes without Dinner Rolls! Add yeast to warm water and allow to proof for 2 minutes. Add olive oil, sugar, and salt. Mix well. Stir in flour 1/2 cup at a time. Knead with dough hook or by hand 3 - 5 minutes. Allow dough to rest 10 minutes. Form into balls (15 - 20) and place on a baking sheet or pan (I used a cast iron pot). If placing against one another, coat lightly with olive oil. Bake at 400 degrees for approximately 10 minutes (if placing against one another they may take a few more minutes). « Taco Salad – Easy Meal Idea! 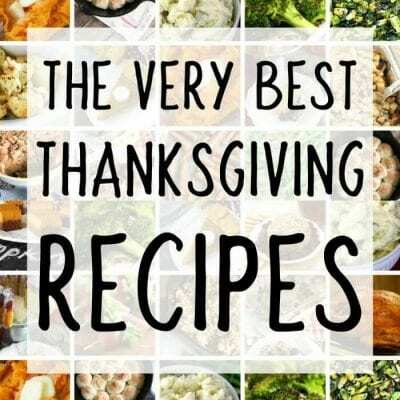 This is fantastic collection of Thanksgiving recipes, and dinner rolls are actually one of my favorite things about Thanksgiving, ha! Thanks so much for the recipe and the all the Thanksgiving recipe inspiration! I’m British so very sadly we don’t celebrate Thanksgiving, but I love to hear and read all about it and salivate over all the delicious recipes. I love that you’ve given ideas for the best of lots of classic recipes here. so glad you like our thanksgiving recipes!